Saturday night’s NASCAR Whelen Southern Modified Tour season finale at Ace Speedway was playing out like a broken record. A fan of the Southern Modified Tour would say they’d seen this playing out many times. Series speedster Jay Hedgecock was out front, leading laps and pulling away from the rest of the field. Brian Loftin was fighting from the back of the pack, trying to get his #23 to the front. Burt Myers was running a conservative race, waiting for the end. Junior Miller was trying his get his #69 perfect. But this race had a much different ending, even though the storylines played out much the same. 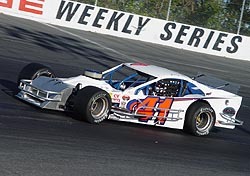 In a season fraught with so many mechanical problems and just plain bad racing luck, Hedgecock held his #41 together for all 150 laps, and took his first series victory in the 12th and final race of the season. And like has happened all season, Hedgecock was expecting something… anything… to happen. “I figured something was going to happen again because I’d run the crap out of the thing for all 150 laps,” said Hedgecock after the race. “I figured if it was going to fall apart, it was going to fall apart. I was going to lead as many laps as I could. But there was another story playing out all race long, behind Hedgecock and the charging Loftin. That was the story of the championship race. Heading into the event, “the King of the Southern Modifieds” Junior Miller led Burt Myers by just 28 points. All Miller had to do was finish fifth or better to lock up the championship. And with Miller starting from the pole following the redraw (and already earning one win at the track earlier this season), it looked like the title might be a lock, no matter what Myers could do. But as the race progressed, so did the title outlook. Miller fell back to third, then fourth and then fifth. Then, with an ill-handling car, the team brought Miller into the pits to make some adjustments, putting him back to 12th. With Miller 12th, and Myers running where he was, the points lead was down to just five points. The championship chase was close. It was, literlly, going to come down to the final few laps. 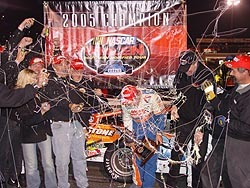 That is, until Myers’ season came to a head on lap 123, when, while battling for fifth, he got together with Frank Fleming, causing a chain reaction that damaged his car and ended his championship hopes. 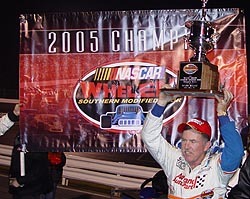 Myers eventually finished ninth, with Miller coming home eighth, and securing the first NASCAR Southern Modified Tour title. the race, I just ran what I needed to run the championship. I didn’t want to pressure the issue. We run the whole season to win the championship. Needless to say, Myers was not happy with Fleming after the race. “I was just trying to bide my time,” said Myers. “I tried to get a couple there early so I could get them out of the way and put myself in a good spot. I thought I got in a pretty comfortable spot there. We caught Frank and I think he pulled the damn school bus sign out. I don’t want to talk bad about anyone, but that is not the way to race people. That is not the way I want to go out when racing for a championship. I don’t want to go out because Frank Fleming wants to race for fifth-, sixth- or seventh-place like he did. Fleming said Burt knew what he was going to get into. Junior Miller earned his 13th career championship, and his team was able to show their appreciation for the effort in the celebration. So as the title chase played out, Hedgecock just kept on trucking. Loftin, who started sixth, made his way to second, but had nothing for Hedgecock at the end. And Hedgecock picked a tough weekend to finally get his first win of the year, considering so much attention would be paid to the championship victor. “It was a good night,” said Hedgecock. “The car ran really good. We could run right on the bottom through one and two and in three and four, I could pretty much pick where I wanted to go, depending on traffic. 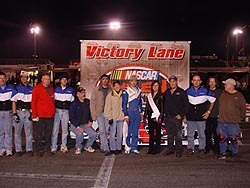 Hedgecock said his entire team was the reason he finally made it to Victory Lane. And as a Whelen representative congratulated Hedgecock, he was able to crack a quick little joke.